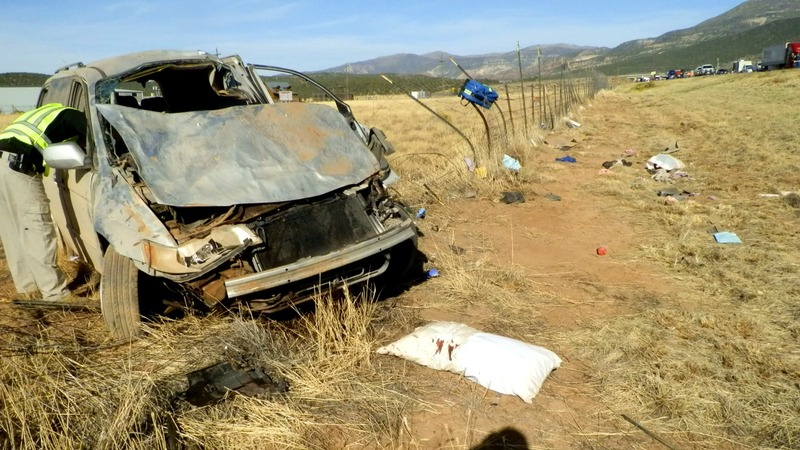 ST. GEORGE — A passenger was killed and seven occupants, six of them young children, were injured in a rollover on Interstate 15 just south of Cedar City Saturday afternoon. Shortly after 4 p.m. officers and emergency personnel responded to the single-vehicle rollover on southbound I-15 near mile marker 54 involving a silver 2003 Honda Odyssey carrying eight occupants, Utah Highway Patrol trooper Michael Gordon told Cedar City News. Upon arrival, troopers found that one female passenger, later identified as 27-year-old Nancy Morales, of Cedar City, was ejected during the crash and pronounced dead at the scene. The driver and six young children passengers remained in the vehicle during the rollover and were transported to area hospitals, Gordon said. Intermountain Life Flight was also launched due to the severity of injuries. According to a witness at the scene, the helicopter landed on the interstate to load the patients. At the time of the crash, the minivan was heading south on I-15, Gordon said, and according to witness statements at the scene, either a semitractor-trailer or a large RV began to merge into the lane the minivan was traveling in. “The minivan was trying to get away from that vehicle when it lost control and went off of the roadway,” the trooper said. Once the minivan skidded onto the soft shoulder, it rolled multiple times, crashed through a barbed-wire fence and then came to rest in an upright position. The woman who died was not wearing a seat belt at the time of the crash, according to a statement released by UHP. All southbound traffic was stopped, and both travel lanes were closed for more than an hour for the helicopter landing and to allow responders to tend to the scene. Both southbound lanes were reopened for travel at around 5:45 p.m.
Oh snap! Inattentive driving puts a busload of peeps in the hospital. How about being courteous and giving way to merging traffic? I feel sorry for this family. People blame the RV/truck, but what about just putting on the brakes, and wearing a seat belt? I would assume the alleged merging vehicle failed to stop and cannot be identified.